Karol Ibarra Zetter, a PhD candidate in Hispanic Linguistics has received the College of Arts & Sciences Bilinski Foundation Fellowship for the 2018-2019 academic year. This fellowship provides financial support for top doctoral students who demonstrate financial need while conducting research for or completing their doctoral dissertations. 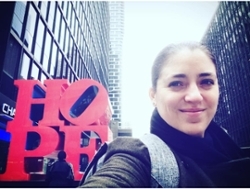 Karol will use the fellowship to complete her dissertation which focuses on how vocalic sequences in highly frequent words tend to be pronounced with a decreased effort and/or duration in articulatory gestures, in conversational Spanish. Felicidades. Keep up the great work!